Karl Friedrich Benz, for whom an alternate French spelling of Carl is used occasionally, (November 25, 1844, Karlsruhe, Germany – April 4, 1929, Ladenburg, Germany) was a German engine designer and automobile engineer, generally regarded as the inventor of the gasoline-powered automobile. Other German contemporaries, Gottlieb Daimler and Wilhelm Maybach, also worked independently on the same type of invention, but Benz patented his work first and, after that, patented all of the processes that made the internal combustion engine feasible for use in automobiles. In 1879 Benz was granted a patent for his first engine, which he designed in 1878. In 1885, Benz created the Motorwagen, the first commercial automobile. It was powered by a four-stroke gasoline engine, which was his own design. He was granted a patent for his automobile which was dated January 29, 1886. The automobile had three wheels, being steered by the front wheel and with the passengers and the engine being supported by the two wheels in the rear—some now refer to it as the Tri-Car. In 1896, Karl Benz designed and patented the first internal combustion flat engine with horizontally-opposed pistons, a design that is still used in some high performance engines used in racing cars. 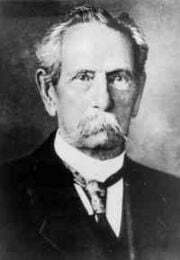 Karl Benz founded the Benz Company, precursor of Daimler-Benz, Mercedes-Benz, and DaimlerChrysler. Before dying he would witness the explosion of automobile use during the 1920s, thanks to his inventions. Karl Benz was born Karl Friedrich Michael Vaillant, in Karlsruhe, Baden, which is part of modern Germany, to Josephine Vaillant and a locomotive driver, Johann George Benz, whom she married a few months later. When he was two years old, his father was killed in a railway accident, and his name was changed to Karl Friedrich Benz in remembrance of his father. Benz had originally focused his studies on locksmithing, but eventually followed his father's steps toward locomotive engineering. On September 30, 1860, at age fifteen he passed the entrance exam for mechanical engineering at the University of Karlsruhe which he subsequently attended. Karl Benz was graduated from the university on July 9, 1864 at the age of 19. In 1871, at the age of 27, Karl Benz joined August Ritter in launching a mechanical workshop in Mannheim, also dedicated to supplying construction materials: the Iron Foundry and Mechanical Workshop, later renamed, Factory for Machines for Sheet-metal Working. Despite such business misfortunes, Karl Benz led in the development of new engines. To get more revenues, in 1878 he began to work on new patents. First, he concentrated all his efforts on creating a reliable gas two-stroke engine, based on Nikolaus Otto's design of the four-stroke engine. A patent on the design by Otto had been declared void. Benz finished his two-stroke engine on December 31, 1878, New Year's Eve, and was granted a patent for it in 1879. After all the necessary agreements, Benz was unhappy because he was left with merely 5 percent of the shares and a modest position as director. Worst of all, his ideas weren't considered when designing new products, so he withdrew from that corporation just one year later, in 1883. Benz's lifelong hobby brought him to a bicycle repair shop in Mannheim owned by Max Rose and Friedrich Wilhelm Eßlinger. In 1883, the three founded a new company producing industrial machines: Benz & Company Rheinische Gasmotoren-Fabrik, usually referred to as Benz & Cie. Quickly growing to 25 employees, it soon began to produce gas engines as well. The company gave Benz the opportunity to indulge in his old passion of designing a horseless carriage. Based on his experience with, and fondness for, bicycles, he used similar technology when he created an automobile with a four-stroke engine of his own design between the rear wheels. Power was transmitted by means of two roller chains to the rear axle. Karl Benz finished his creation in 1885 and named it the Benz Patent Motorwagen. It was the first automobile entirely designed as such, not simply a motorized carriage, which is why Karl Benz is regarded by many as the inventor of the automobile. The beginnings of the Motorwagen in 1885 were less than spectacular. The tests often attracted many onlookers who laughed mockingly when it smashed against a wall because it initially was so difficult to control. The Motorwagen was patented on January 29, 1886 as DRP-37435: "automobile fueled by gas". The first successful tests were carried out in the early summer of 1886 on public roads. 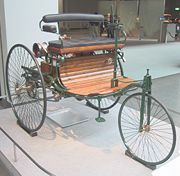 The next year Benz created the Motorwagen Model 2 which had several modifications, and in 1887, the definitive Model 3 with wooden wheels was introduced. Early customers faced significant problems. At the time, gasoline was available only from pharmacies that sold it as a cleaning product, and they didn't stock it in large quantities. The early-1888 version of the Motorwagen had to be pushed when driving up a steep hill. This limitation was rectified after Berta Benz made her famous trip driving one of the vehicles a great distance and suggested to her husband the addition of another gear. The popular story goes that, on the morning of August 5, 1888, Berta Benz took this vehicle (without the knowledge of her husband), and embarked on a 106 km (65 miles) trip from Mannheim to Pforzheim to visit her mother, taking her sons Eugen and Richard with her. In addition to having to locate fuel at pharmacies on the way, she also overcame various technical and mechanical problems and finally arrived at nightfall, announcing the achievement to Karl Benz by telegram. Today the event is celebrated annually in Germany with an antique automobile rally. Benz's Model 3 made its wide-scale debut to the world in the 1889 World's Fair in Paris, and about 25 Motorwagens were built during the period between 1886 and 1893. The great demand for stationary, static internal combustion engines forced Karl Benz to enlarge the factory in Mannheim, and in 1886 a new building located on Waldhofstrasse (operating until 1908) was added. Benz & Cie. had grown in the interim from 50 employees in 1890 to 430 in 1899. During the last years of the nineteenth century—Benz & Company—was the largest automobile company in the world with 572 units produced in 1899. Because of its size, in 1899, the Benz & Cie. became a joint-stock company with the arrival of Friedrich Von Fischer and Julius Ganß, who came aboard as members of the Board of Management. Ganß worked in the commercialization department. The new directors recommended that Benz should create a less expensive automobile suitable for mass production. In 1893, Karl Benz created the Victoria, a two-passenger automobile with a 3-hp engine, which could reach the top speed of 11 mph and a pivotal front axle operated by a roller-chained tiller for steering. The model was successful with 45 units sold in 1893. In 1894, Benz improved this design in his new Velo model. This automobile was produced on such a remarkably large scale for the era—1,200 units from 1894 to 1901—that it is considered the first mass-produced automobile. 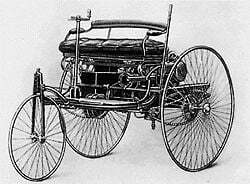 The Benz Velo also participated in the first automobile race: Paris to Rouen 1894. In 1896, Karl Benz was granted a patent for his design of the first flat engine with horizontally-opposed pistons, a design in which the corresponding pistons reach top dead centre simultaneously, thus balancing each other with respect to momentum. Flat engines with four or fewer cylinders are most commonly called boxer engines, boxermotor in German, and also are known as horizontally opposed engines. This design continues to be used in high performance automobile racing engines. Although Gottlieb Daimler died in March of 1900—and there is no evidence that Benz and Daimler knew each other nor that they knew about each other's early achievements—eventually, competition with Daimler Motors (DMG) in Stuttgart began to challenge the leadership of Benz & Cie. In October of 1900 the main designer of DMG, Wilhelm Maybach, built the engine that would be used later, in the Mercedes-35hp of 1902. The engine was built to the specifications of Emil Jellinek under a contract for him to purchase 36 vehicles with the engine and for him to become a dealer of the special series. Jellinek stipulated that the new engine must be named, Daimler-Mercedes. Maybach would quit DMG in 1907, but he designed the model and all of the important changes. After testing, the first one was delivered to Jellinek on December 22, 1900. Jellinek continued to make suggestions for changes to the model and obtained good results racing the automobile in the next few years, encouraging DMG to engage in commercial production of automobiles, which they did in 1902. Benz countered with his Parsifil automobile, introduced in 1903 with 2 vertical cylinders and a top speed of 37 mph. Then, without consulting Benz, the other directors hired some French designers. France was a country with an extensive automobile industry based on Maybach's creations. Because of this action, after difficult discussions, Karl Benz announced his retirement from design management on January 24, 1903, although he remained as director on the Board of Management through its merger with DMG in 1926 and, remained on the board of the new Daimler-Benz corporation until his death in 1929. By 1904 the sales of Benz & Cie. were up to 3,480 automobiles and the company remained the leading manufacturer of automobiles. Along with continuing as a director of Benz & Cie., Karl Benz soon would found another company—with his son, Eugen—that was closely held within the family, manufacturing automobiles under another brand and using a French spelling variant of Benz's first name for the first initial of the privately-held company (see discussion in the next section). In 1909 the Blitzen Benz was built in Mannheim by Benz & Cie. and the racecar set a land speed record of 228.1 km/h, said to be "faster than any plane, train, or automobile" at the time. The racecar was transported to several countries, even to the United States, to establish multiple records of this achievement. The bird-beaked, aerodynamically-designed vehicle contained a 21.5-liter displacement, 200-horsepower engine. The land speed record of the Blitzen Benz was unbroken for ten years. Karl Benz, Bertha Benz, and their son, Eugen, moved to live in nearby Ladenburg, and solely with their own capital, founded the private company, C. Benz Sons (German: Benz Söhne) in 1906, producing automobiles and gas engines. The latter type was replaced by petrol engines because lack of demand. This company never issued stocks publicly, building its own line of automobiles independently from Benz & Cie., which was located in Mannheim. The Benz Sons automobiles were of good quality and became popular in London as taxis. During a birthday celebration for him in his home town of Karlsruhe on November 25, 1914, the 70-year-old Karl Benz was awarded an honorary doctorate by his alma mater, the Karlsruhe University, thereby becoming—Dr. Ing. h. c. Karl Benz. During the First World War, Benz & Cie. and Daimler Motors (DMG) both had massively increased their production for the war effort. After the conflict ended, both manufacturers resumed their normal activities, but the German economy was chaotic. The automobile was considered a luxury item and as such, was charged a 15% extra tax. At the same time, the country suffered a severe lack of petroleum. To survive this difficult situation, in 1919 Benz & Cie. proposed a cooperation suggested by Karl Benz through a representative, Karl Jahn, but DMG rejected the proposal in December. On June 28, 1926, Benz & Cie. and DMG finally merged as the Daimler-Benz company, baptizing all of its automobiles Mercedes Benz honoring the most important model of the DMG automobiles, the 1902 Mercedes-35hp, along with the Benz name. 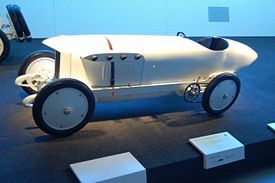 The name of that DMG model had been selected after ten-year-old Mercedes Jellinek, the daughter of Emil Jellinek (by then one of DMG's partners) who had set the specifications for the new model. Benz was a member of the new Board of Management for the remainder of his life. A new logo was created, consisting of a three pointed star (representing Daimler's motto: "engines for land, air, and water") surrounded by traditional laurels from the Benz logo, and was labeled Mercedes-Benz. On April 4, 1929, Karl Benz died at home in Ladenburg at the age of 84 from a bronchial inflammation in his lungs. Until her death on May 5, 1944, Bertha Benz continued to reside in their last home. Members of the family resided in the home for thirty more years. The Benz home now has been designated as historic and is used as a scientific meeting facility for a nonprofit foundation, the Gottlieb Daimler and Karl Benz Foundation, that honors both Bertha and Karl Benz for their roles in the history of automobiles. Credit for inventing the automobile almost certainly must be shared, since several men made significant contributions to its development. However, Benz can be considered to have invented the modern, mass-produced, commercially viable motorcar. As such, his legacy lives on both through the continued popularity and reputation for quality of the brand he founded, and through the automobile itself. Human life has been revolutionized by the motorcar. Travel and commerce within and between states has been made easier. People in isolated communities have access to services. Despite the problems associated with pollution and the use of non-renewable fuel, human life has, generally, benefited from the motorcar. ↑ "Benz, az automobilok atyja," National Geographic Benz, az automobilok atyja; "1844. november 25-én Karlsruheban született Karl Friedrich Vaillant, a Benz autógyár alapítója. Mivel születésekor anyja még hajadon volt, ezért az ő neve után anyakönyvezték. Vaillant csak később vette fel apja nevét, a Benz-et." Retrieved August 20, 2007. ↑ Kark Benz 'Realname:, Karl Friedrich Michael Vaillant. Birthdate:, 25 Nov 1844. Deathdate:, 4 Apr 1929. Birthplace:, Germany, Baden-württemberg, Karlsruhe ...' Retrieved August 20, 2007. ↑ "Carl Benz machte die Welt mobil," Morgan Web Carl Benz machte die Welt mobil "Bei seiner Geburt am 25. November 1844 in Karlsruhe erhielt der spätere Auto-Pionier den Namen Karl Friedrich Michael Vaillant. Seine Mutter Josephine Vaillant heiratete ein Jahr danach Johann Georg Benz, den Vater des Kindes'. Retrieved August 20, 2007. ↑ "De vergelijking van symbolen uit vroegere tijden met de logo's van hedendaagse automerken" egoproject De vergelijking van symbolen uit vroegere tijden met de logo's van hedendaagse automerken Retrieved August 20, 2007. ↑ Karl Benz "Karl Benz wurde alls Karl Friedrich Michael Vaillant in heutige Kalruher Stadtteil Mühlburg geboren. Sein mutter hat ein man bei der name Johann Georg Benz.l Er storp eine veile nach das hochzeit." Retrieved August 20, 2007. ↑ Karl is the spelling of his first name on all of his official personal and municipal documents throughout his life, such as birth, school, honorary doctorate, the Baden State Metal certificate, and on his family grave marker. Carl is the spelling variant he used for one company, C. Benz Söhne, he formed with his son Eugen after leaving the active management of his long standing company, but remaining on its board of directors for the rest of his life (through its merger with DMG in which the two companies became Daimler-Benz), and it is used for his autobiography by a recent publisher. This spelling variant has been copied often and may be found frequently. ↑ DRP's patent No. 37435 (PDF, 561 kB, German) was filed January 29, 1886 and granted November 2, 1886, thus taking effect January 29. Retrieved August 20, 2007. Siebertz, Paul. Karl Benz; ein Pionier der motorisierung. Stuttgart: Reclam-Verlag, 1950. Das Automuseum Dr. Carl Benz in der alten Benz Fabrik the Dr. Carl Benz Auto Museum created by a private group in 1996. This page was last modified on 12 April 2018, at 13:57.